Vortex Razor AMG UH-1 vs. Eotech 512 Review - Best Comparison in 2019 April! 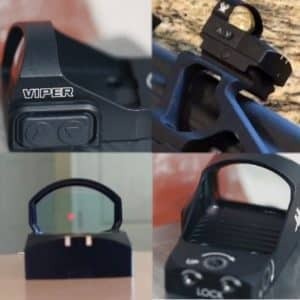 In this article I present you with two different sight systems, they look and feel different but are meant to provide similar characteristics and performance in the field. The Eotech is around 15% more expensive than the Vortex Razor. Both use holographic imagery and both illuminate using batteries, but that’s as far as the similarities go. I will review both devices to determine whether the EOTech price tag is warranted. The Vortex Razor® AMG™ UH-1™ is one of the most popular tactical sights on the market today and is a tough competitor in any comparative match. This model gives you absolutely zero distortion with a clear sight picture with an unobstructed view, so it’s fast to acquire any target. The body of the Razor is made from a rugged aluminum alloy and while it is larger in size is actually lighter than it looks, but at the same time is extremely rugged and this makes up for its body. Vortex uses their scratchproof XR optic coating that fully coats the optics and delivers a scratch free and anti-reflective coating that enhances the holographic elements. Now for a word on The UH-1™ holographic technology. This model uses a proprietary Fusion Hologram with Quantum Well Light Control (FHQ™) technology. 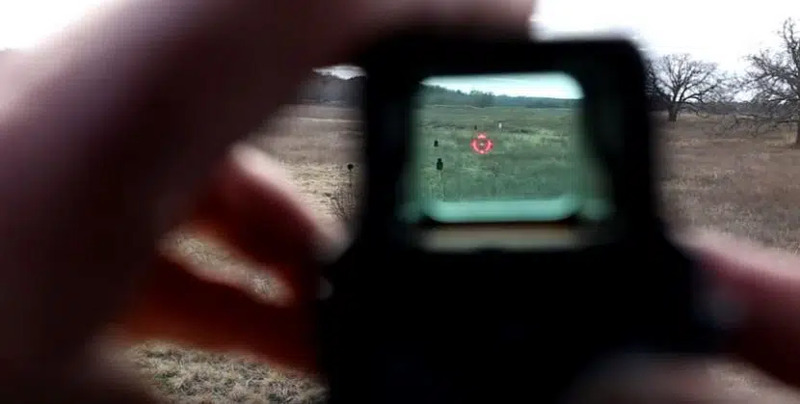 As such, this system gives you the very first holographic sight that melds the sight picture, zero-distortion, and the reticle pattern of a holographic sight with the durability and energy efficiency of a red dot. Another stand out feature is the 15 levels of brightness and comes with an integrated mount option for both Weaver and Picatinny. It also comes with 2 battery options to use, either the CR123A or the LFP123A. If you use the LFP123A battery, you get a Micro USB port for recharging. This model works well with any rifle and carbine and its superior mounting options give it more versatility over different models. The Model 512 HWS® comes in a totally different package and is lightweight and long, rather than square like the Razor. This model comes in a number of finishes including the Realtree™ APG and Mossy Oak® Obsession camo patterns, as well as the standard matte black. The 512 is made from a rugged aluminum alloy and has simplistic features; it’s a no-nonsense model designed for performance and not looks. The stand out feature on this sight is the extremely rapid reticle-on-target acquisition performance, where the superimposed holographic reticle lets you maintain a constant vigil on the target through the scope without shifting the focus. The HWS® uses either the projected holographic image of a reticle on the target plane or as a bright open reticle image or a fine dot. You get a 1 MOA aiming dot with a 0 – 68-minute ring and vertical and horizontal stadia. It also gives you 20 adjustable brightness levels that come with an automatic brightness shut off mode after 8 hours of use. 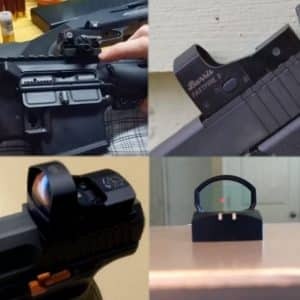 This is a Close Quarter Battle (CQB) sight that uses the larger ring for fast aiming precision and is best when paired with an M4A1 carbine, however it works well with all rifles. Approximately 1,000 continuous hours (lithium) at nominal setting 12; 600 continuous with AA alkaline at room temp. Battery Life 1,500 hrs, 600hrs LI: 1,000 hrs, Alk. 600 hrs. When comparing the two on paper, even before looking and applying them in real life, you immediately see the differences. It’s when you actually handle them, mount them and use them that the differences become significantly exponential the point of absurdity. The Vortex Razor AMG UH-1 Holographic Sight is also known as the “Huey” and is a heavier and chunkier sight than the Eotech. Not only is it a more robust model, but it also has the ArmorTek coating that makes their optics superior in scratch resistance. 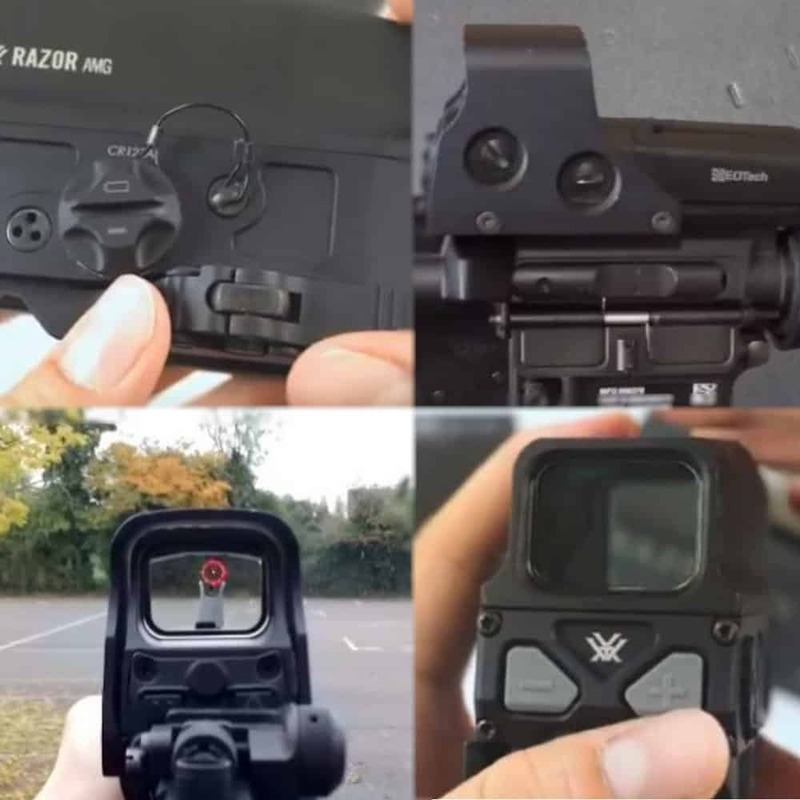 The glass used in the Razor is clearer than that used on the Eotech. The Eotech come with a 3” shatter-proof glass-laminate covering the rear-facing window. It is also gas purged and like the Razor is fog free. The Vortex Razor mounting system is by far the superior model, providing a quick-release bracket with a lock button and a locking screw. 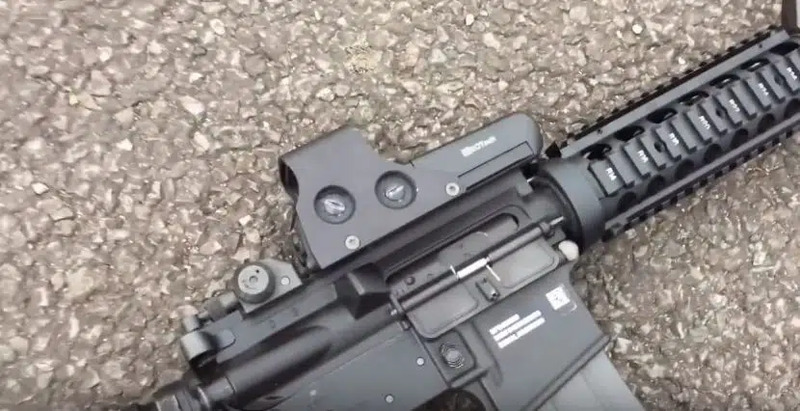 This is by far more adaptable and advanced when compared to the more simple mounting system that the Eotech sight gives, which is basically only a locking screw. 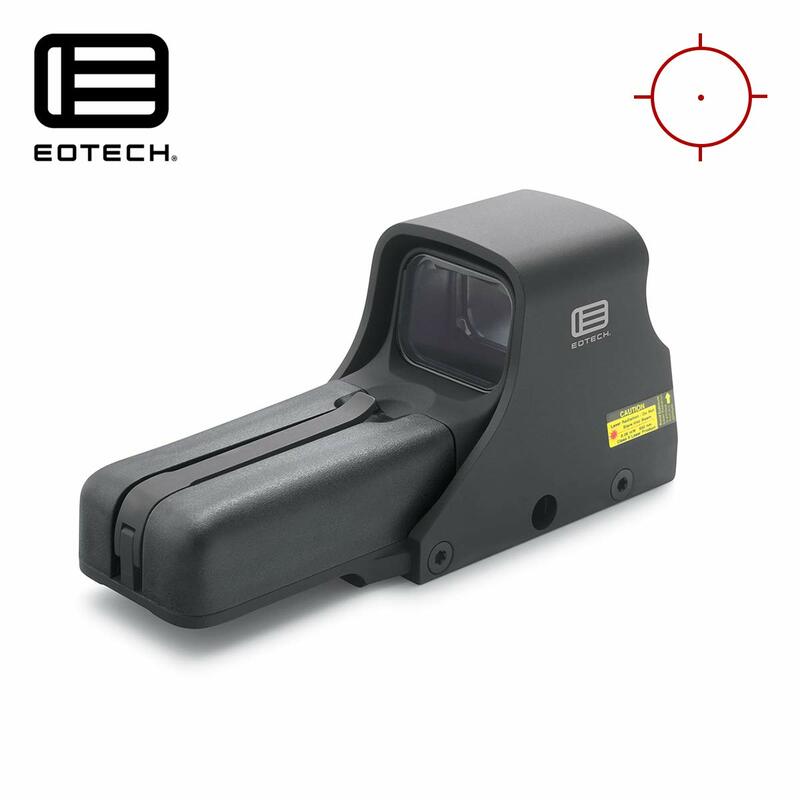 The Eotech does give an easier and intuitively simpler above 100-meter distances. Eotech also gives you a point-shaped ballistic correction that actually works against a fast accurate application. Opposed to this simple system, the Vortex AMG-UH1 gives you a unique shape that integrates scientific range finding and is much more accurate and is night vision compatible that is incorporated into their model at no extra cost, unlike the Eotech. The Vortex offers two battery options versus the Eotech standard AA battery. The Vortex LFP123A batteries will last 600 hours using the LFP, and 1,500 hours when using the CR batteries. The Eotech lasts 600 hours on alkaline and 1,000 on lithium rechargeable batteries. The difference is 500 hours in favor of the Vortex. The Vortex is a heavier instrument coming in at 11.8 ounces which is 0.9 ounces heavier than the 10.9 ounces Eotech. In terms of dimensions, the Vortex is 3.4” x 5.4” x 4.7” while the Eotech is 5.6” x 2” x 2.5”. This means and shows that the Vortex is a larger box shape, while the Eotech is longer and slimmer. The Vortex can submerge up to 80 feet while the Eotech can only go under to 10 feet, so for marine activity such as diving to reach targets, the Vortex is much more tactical than the Eotech. Both sights are Argon purged and both have seals in place which provides both waterproofing as well as fog proofing qualities. The seals also provide the elasticity to support the optics from cracking due to recoil and blows. 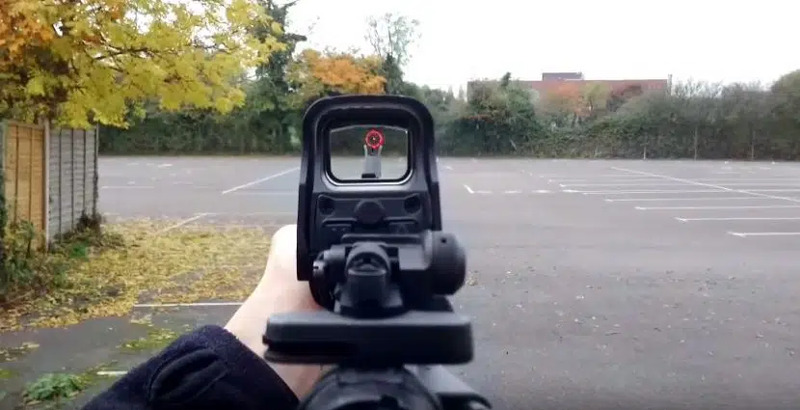 Both these sights are designed for quick combat performance, as such, they must be fast and adaptable in any situation. As such, based on the comparison of all features, the Vortex is by far a more superior model. While size and weight are important, overall performance comes down to how the sight handles in both relaxed sightings as well as rapid sighting situations. 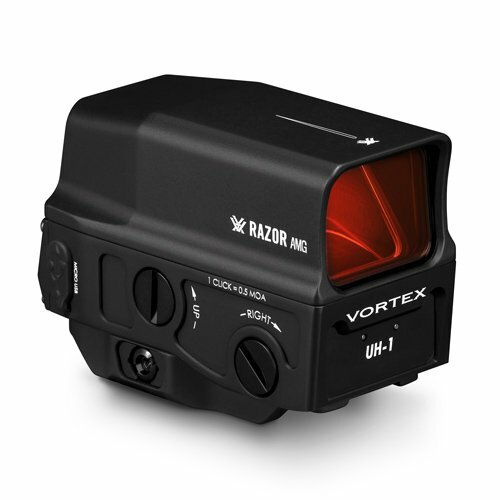 The Vortex Razor AMG-UH1 sight wins hands down and goes to show that price is not indicative of performance or quality. In this instance, the lower priced Razor outperforms by far the more expensive Eotech. Bottom line: The Razor AMG UH-1 Holographic Sight outperforms the EOTech 512, and apart from the size difference, and nearly one-ounce difference, the Razor is the better sight.